After running for eighth seasons, FOX cancelled the 24 TV series due to declining ratings. Now, the characters are back for a “limited” series of 12 episodes. Will the ratings be good enough for the network to renew 24 for another season or will this be the end for Jack Bauer for good? Stay tuned! 24: Live Another Day: is set four years after the events of season eight and finds Jack (Kiefer Sutherland) in London, once again trying to prevent a global disaster. The rest of the cast includes Yvonne Strahovski, Tate Donovan, Mary Lynn Rajskub, William Devane, Gbenga Akinnagbe, Giles Matthey, Michael Wincott, Benjamin Bratt, and Kim Raver. Final season averages: 1.8 rating in the 18-49 demographic with 6.33 million total viewers. For comparison: The last regular season of 24 averaged a 2.9 rating in the 18-49 demographic with 9.28 million total viewers. What do you think? Do you still like the 24 TV series? Do you think it should be cancelled again or renewed for another season? 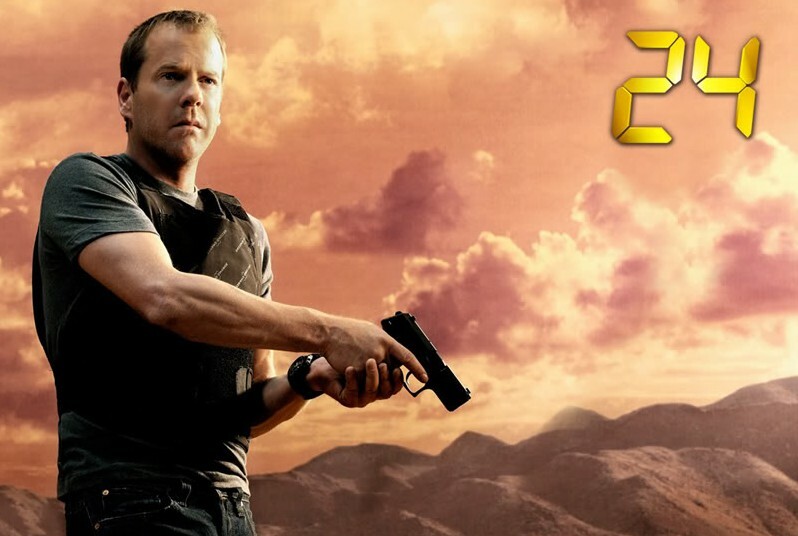 24: Will the Series Be Cancelled or Continue for Season Nine? The best action show – made for TV – i just watched season 6,7,8 again. Jack Bauer is the greatest – you have to Cloe is the next episode. definitely bring it back. It needs another 1-2 seasons. Please pls pls pls bring back 24. that is all l cn say. There’s little satisfaction in watching TV these days with all of the alleged reality shows and stupid sit coms or 40 year old reruns over and over. PLEASE bring back 24 series to make at least one night a week enjoyable. This country needs Jack Bauer in SO many ways!!!!!!!!!!!!!!! Is there anyone out there listening to us. It minds me of star trek. They canceled after three season and you know what happened after that . (trekies all over the place). We need Jack Bauer to help us defeat ISIS! I was glad to see 24back on tv, even though it was for a limited time. I really miss Jack. This was one show that kept you on your seat. I really wish they would consider bringing back the show for next season. Please bring 24 back, it is by doubt one of the most exciting, suspense filled show that I have seen in a long time. I watched it the entire 8 seasons it was on tv. However, I still watch the reruns now. Most of the show on tv now are reality shows that I care not to watch. I hope they are planning to bring back another series in 2015 and if not 2016. My husband and I LOVE “24”. We think Keifer Southerland is wonderful as Jack Bauer! We saved the last 2 episodes of this past season and we are now watching them again 2 days after Christmas! Please keep this show on the air! We are ready for some new episodes!! 24 is my favourite TV show of all time and the final episode of LAD ranks as one of my favourite episodes (Jack finally killed Cheng Zhi). So take Jack away from spending the rest of his life in a Russian prison and make more seasons please. 24 is my favourite TV show of all time. And the final episode of Live Another Day ranks as one of my all-time favourite episodes (Jack Bauer FINALLY kills Cheng Zhi). Jack doesn’t deserve to spend the rest of his life locked up in a Russian prison, so please make more seasons. Keep this show on air. I love it! It’s just as good as it was the first years. It would be a shame to see the studio cancel such a great show again! I remember when star trek was canceled and it went on and became incredibly big making million and billions of dollar. There is an old saying, don’t fix something that is not broken. Great show that if canceled would be a great loss to all the fans of 24 and the TV station producing it. Long live the show that gives thrills and suspense to so many people across the country. THIS I WOULD TRULY LOVE TO MAKE A COME BACK …. AND THE SOONER THE BETTER . .. I WATCHED THIS SHOW INTENTLY. .. WOULD NOT ANSWER PHONE OR TALK TO ANYONE WHEN IT WAS ON . ..
LET’S GET BUSY AND BRING THIS ONE BACK FOR SURE. . .
Do you think the time of year had anything to do with the drop in ratings? (even tho’ it’s hard to believe!) LOTS of people vacation, have company, etc. when it aired…. MISS JACK SO MUCH and the cast & storylines.